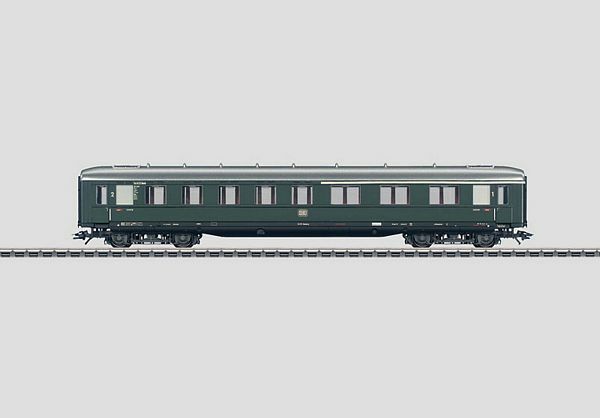 Prototype: German Federal Railroad (DB) type AB4üwe-39/51 "Schürzenwagen" ("skirted passenger car") compartment car. 8 compartments, 1st and 2nd class. The car ends appear as they did after conversion work. Model: The car is full scale length. It has underbody details specific to this type of car. The trucks are based on the Görlitz III lightweight design. The car is ready for installation of 7319 current-conducting couplings or 72020/72021 current-conducting couplers. Length over the buffers 24.4 cm / 9-5/8. DC wheel set 4 x 700580.